A September 2018 rendering of SpaceX's Big Falcon Rocket launching through the cloud tops and toward space. Elon Musk and SpaceX have published new renderings of the Big Falcon Rocket launch system, which is designed to ferry people to the moon and Mars. The release of the images coincided with the naming of the first passenger to fly on the rocket. The images reveal an important design change — instead of one wing, the spaceship now appears to have three wing-like structures. Elon Musk and his rocket company, SpaceX, have published new and imaginative illustrations of a spacecraft that’s supposed to ferry people and supplies to the moon and Mars. 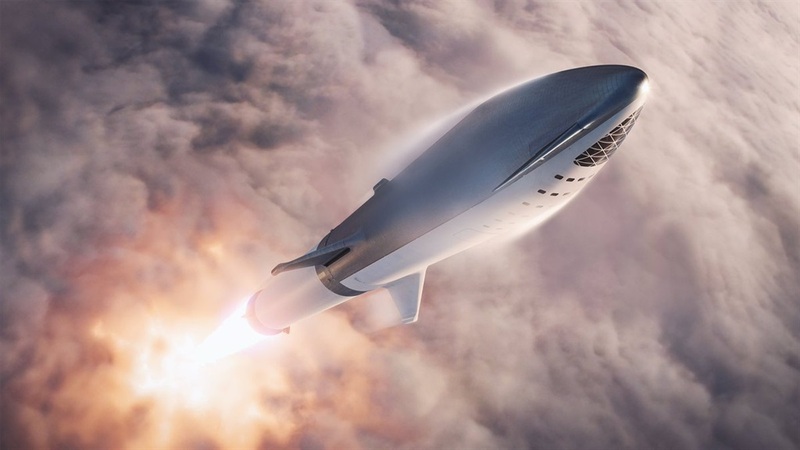 The above rendering of the Big Falcon Rocket, or BFR, as the launch system is called, shows it punching through the cloud tops of Earth and flying toward space. Musk shared the image to Twitter on Monday morning. 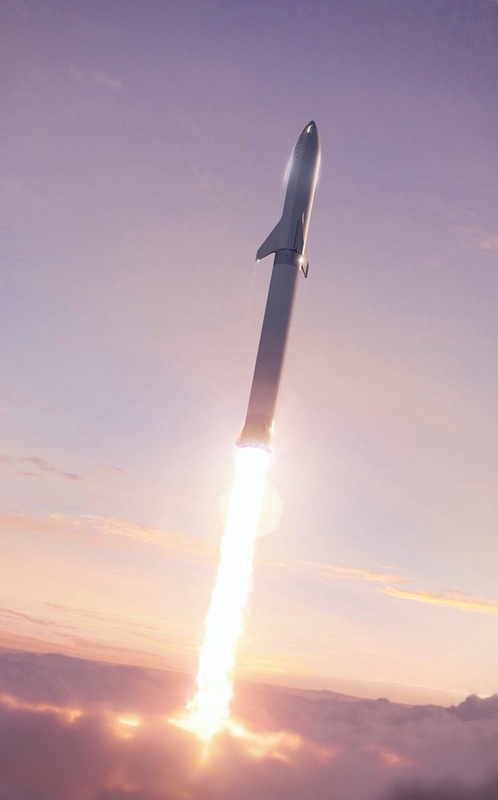 A Sept. 2018 rendering of SpaceX's Big Falcon Rocket launching toward space. 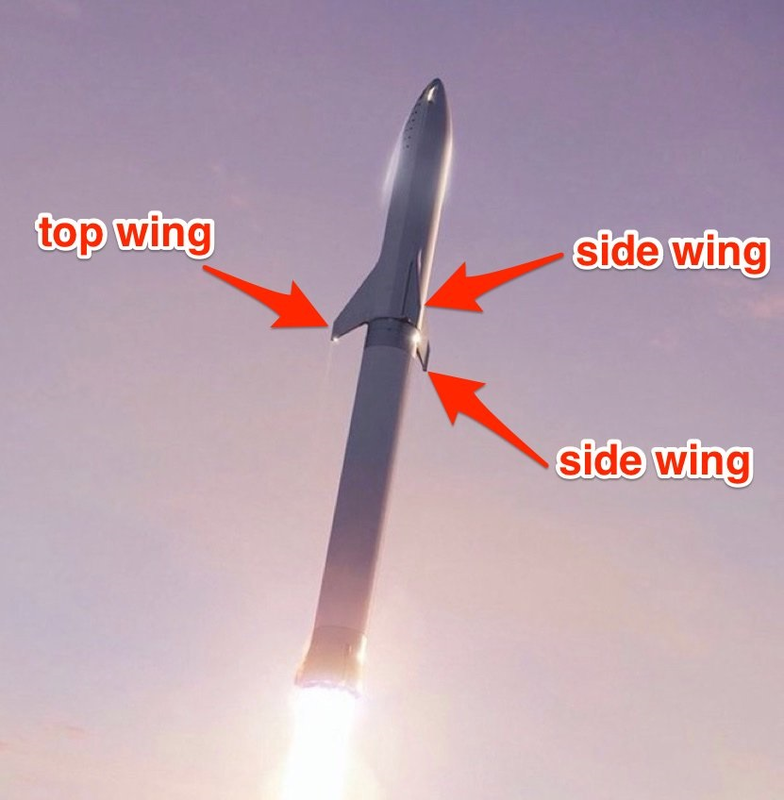 Musk also tweeted a side view of the vehicle (right) that more clearly shows its two stages: a booster, or lower stage, and an upper-stage spaceship. Last week, SpaceX shared an illustration of the ship in space, flying around the moon while firing seven rocket engines. 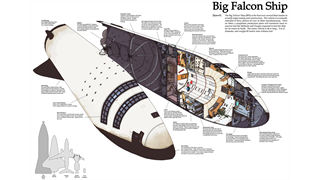 That picture, below, shows the Big Falcon Spaceship — as it’s sometimes called by Musk and his company — without the booster. 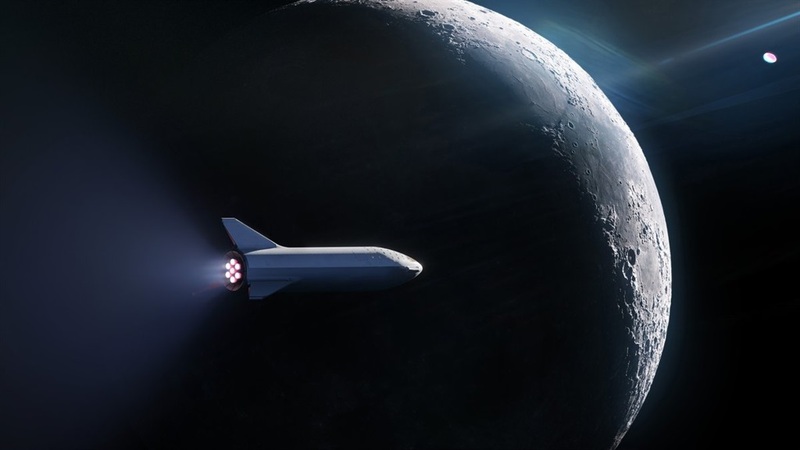 All three images were released just before a major announcement from SpaceX on who the first person will be to ride a BFR spaceship around the moon. 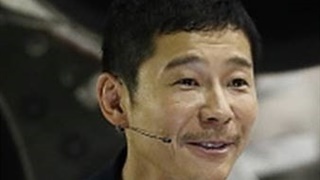 "SpaceX has signed the world's first private passenger to fly around the Moon aboard our BFR launch vehicle — an important step toward enabling access for everyday people who dream of travelling to space," SpaceX said on its website. But these new images may be more important than the revelation of the passenger’s identity. That's because they show off subtle but important differences in a vehicle that is ultimately supposed to ferry up to 100 people and 150 tons of supplies to Mars — and, of course, a person around the moon. 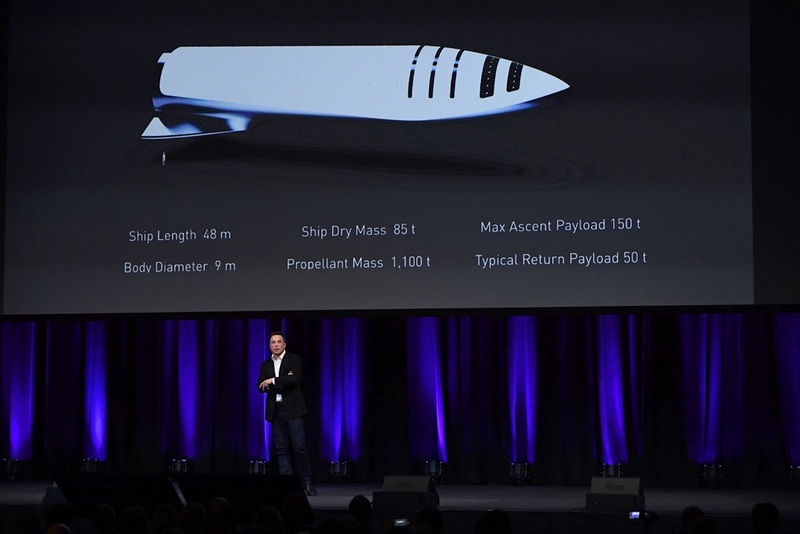 Musk, who is SpaceX’s chief designer, publicly described the BFR and showed renderings of the system at the 2017 International Aeronautical Congress (IAC). According to those plans, the BFR would be 105 metres tall and 10 metres wide. It would be capable of carrying 100 people and 150 tons of supplies. SpaceX CEO Elon Musk speaks at the International Astronautical Congress on September 29, 2017 in Adelaide, Australia. The newly released renderings show each stage of the system having roughly the same proportions. However, the spaceship’s body appears to have got a significant design revision. The 2017 version of the ship had one delta wing, as Musk called it, near its heat shield. The wing is designed to help the ship plough through planetary atmospheres like those of Earth and Mars. 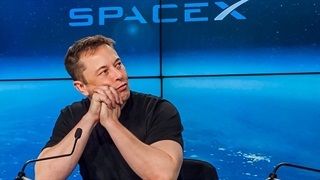 “Depending on whether you're landing on a planet or a moon that has no atmosphere, a thin atmosphere, or a dense atmosphere, and depending on whether you're re-entering with no payload in the front, a small payload, or a heavy payload, you have to balance the rocket out as it's coming in,” Musk said during his 2017 IAC presentation. It appears one wing wasn’t enough, though: There are now three wing-like structures on the spaceship. SpaceX may have decided that these wings are necessary for the system to safely return to Earth. Or perhaps they're for slowing the ship down as it enters Mars' atmosphere, which has air about 1% as dense as our planet’s. The renderings also show another wing on top of the ship, which resembles a tail fin like those on NASA’s space shuttle orbiters. Musk called it “forward moving wing” on Twitter; presumably it's there to help further stabilise the ship as it moves through air. What’s going on with the BFR design changes? We contacted several aerospace experts to get their takes on these design changes. Indeed, the spaceship and other BFR hardware are being prototyped inside a 1,858 square metres tent at the Port of Los Angeles — at least until a much bigger permanent facility is completed. “Elon is an incrementalist and to a great extent he is always thinking aloud. I admire this, but people who do this openly get criticized when their ideas evolve,” Autry said. SpaceX's approach to designing rockets and spaceships is notably different from the way NASA and others do it, he added.